Although Missouri faces a large physician shortage, it is often referred to as one of the largest ‘exporters’ of medical students. Because only about 21% of Missouri medical students remain in the state, Missouri is working on ways to better attract and retain long term clinicians. Missouri is the first state within the United States to allow medical students to practice medicine without completion of a residency. The law, passed in 2017, allows graduated medical students to practice in the primary care field as “assistant physicians” without the completion of a residency. Missouri has established some unorthodox policies, but they are desperate to mitigate the burden facing communities that are underserved. With thousands of miles of coast along the Ozarks, the bustling St. Louis, and a thriving hospital district, Missouri attracts thousands of applicants each cycle. 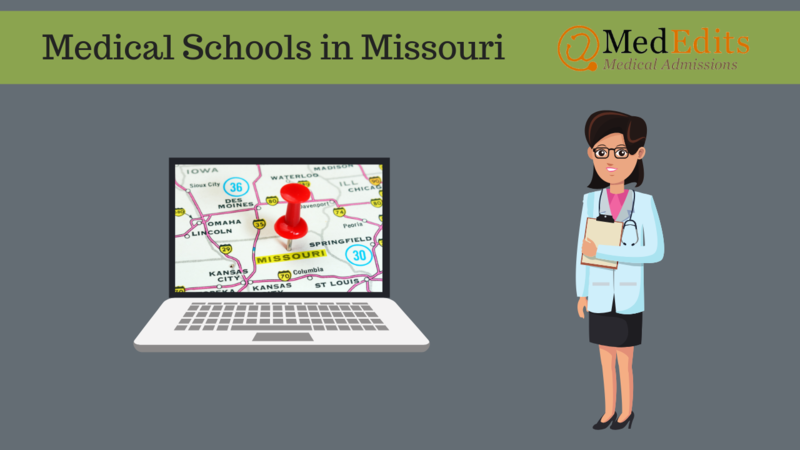 Considering applying to medical schools in Missouri? Sign up for a FREE 15 minute advising session with an admissions expert. How Competitive are you for Medical School Admissions in Missouri? To determine your competitiveness for a Missouri medical school, you must review the average MCATs and GPAs for accepted students as well as the medical school acceptance rates. For out of state students, it is important to pay attention to how many out of state students are interviewed and what percentage are in the entering class each year. So, how difficult is it to get accepted into a Missouri medical school? Let’s review the data. Below are the average MCAT scores and GPAs, interview rates for in state and out of state applicants, acceptance rates, percent of entering class that is in state, and tuition for all medical schools in Missouri. So, what can you do to increase your chances of getting accepted into a Missouri medical school? Missouri medical schools offer a broad range of GPAs and MCAT scores, so when evaluating how competitive you are, be honest with yourself. Are your MCAT and GPA close to the metrics for accepted students? If not, consider retaking your MCAT or enhancing your GPA. Washington University in St. Louis ranks 8th in research according to the US News and World Report. The school has been recognized for its work related to the Human Genome Project, so students with particular interests in microbiology or genetics may find this school particularly intriguing, with countless of research opportunities. If you are interested in family medicine, it may be worth looking into the University of Missouri School of Medicine-Columbia. Its Department of Family and Community Medicine has ranked as one of the top three family medicine programs nationwide for the last 15 consecutive years. For students who demonstrate an early interest in medicine, Kansas City University of Medicine and Biosciences offers a Partners Program, which allows students to apply to medical in their sophomore year of their undergraduate education. Whatever your interests are, Missouri offers an unparalleled flexibility and academic experience.